Home / Naomi Cowan / News / Reggae / SANDALS Resort / Toronto / Reggae Artist . @iamNaomiCowan Partners with SANDALS Resort to Give Back With The "Inspire Hope Hurricane Relief Fundraiser"
Reggae Artist . @iamNaomiCowan Partners with SANDALS Resort to Give Back With The "Inspire Hope Hurricane Relief Fundraiser"
Reggae Artist Naomi Cowan Partners with SANDALS Resort to Give Back With The "Inspire Hope Hurricane Relief Fundraiser"
On Saturday October 14th, Naomi will perform a sneak peek of her upcoming music, along with her brand new single “Things You Say You Love”, a song that is tied to Naomi’s family legacy in reggae music. This song was co-written 50 years ago by her father Tommy Cowan, who famously worked as Bob Marley’s marketing and tour manager. Naomi’s mother, Carlene Davis is also an internationally known and well-loved reggae music singer who started her career in Toronto. Naomi partnered with Toronto's very own Mark Pelli, guitarist & producer from the pop-reggae band 'Magic!' to revamp “Things You Say You Love”. Pelli is both executive producer and featured vocalist on the track. For Naomi, this song, “Represents the unity, and collaborative nature of both the Jamaican and Canadian cultures, Reggae is all about uniting people from all backgrounds”. Naomi is a singer/songwriter who has spent significant time between Toronto and​ ​Kingston Jamaica working on her career to be a voice that empowers communities across the world using her brand motto: Speak, Sing, Give. 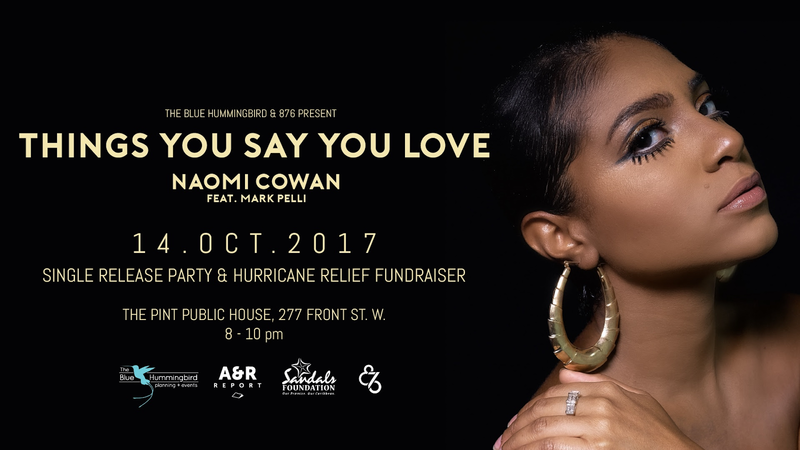 Together with the support of The Sandals Foundation, The Blue Hummingbird, 876 and TmrwTday Culture Fest, Naomi is working to give back to the Caribbean community and those impacted by the Hurricanes through her music and platforms with this incredible Fundraiser.